Inside Creation – INK presents “An evening with Wayne Ngan and Dreamwalkers” at the Dr. Sun Yat-Sen Classical Chinese Garden (578 Carrall Street, Vancouver) on July 25, 2013 from 7:30pm-9:00pm. 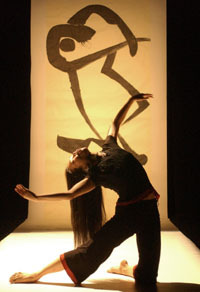 In 2003 choreographer Andrea Nann collaborated with pottery artist and Chinese ink painter Wayne Ngan (Hornby Island) and contemporary dance artists Alison Denham (Vancouver) and Kate Holden (Toronto) to create INK, a 40 minute dance performance inspired by Wayne Ngan’s holistic and embodied creative process of ‘making the invisible visible’. The piece was conceived on the beaches of Hornby Island, but has always been presented in theatrical venues. Now, 10 years later, the artists re-open the creation process during a 5-day artistic residency at the Dr. Sun Yat-Sen Classical Chinese Garden. Here they will explore the deeper connections to nature and culture that are embedded in the work, excavating intersections where dance, visual art, classical landscapes and contemporary culture can interconnect and transform. Please join the artists on July 25th as they invite you to share their experience ‘Inside Creation’ through dialogue, video dance and ink painting. Reserve ticket available at $28 through Dr. Sun Yat-Sen Garden (604) 662-3207. For on-line ordering of tickets for July 25th event, please find here. Admission free for Dreamwalker Dance members renewing $100 membership donation and new members. Full income tax receipt available for donation. Please make your donation check out to ‘Dreamwalker Dance’ and provide a mailing address for your income tax receipt. Please mail your donation to: Beverly Nann, 617-518 Moberly Road, Vancouver, BC V5Z 4G3. A reservation will be made in your name for the July 25th Garden event. Alison Denham – Originally from the Sunshine Coast, Alison is a contemporary dance artist living in Vancouver, BC. She is currently working on a co-production between Vancouver based choreographer, Alvin Erasga Tolentino and Rafaela Giovonola from Bonn, Germany. In June 2012 she created and performed ‘Slowpoke’ with Billy Marchenski based on their trip into the Chernobyl exclusion zone. Ali is thrilled to be working with all the ‘Ink” collaborators again.